Getting rid of those unwanted facial hair is one of the most important part of the lady’s beauty regime. Running to the parlor every time she sees one unnecessary strand of facial hair is not always feasible and there are times when they can go un-noticed. A facial hair trimmer comes handy in these cases. But the problem is that sometimes the facial hairs get noticed in the most unusual of places and in the most odd of times and getting a trimmer out in front of every-one can be very embarrassing for a lady. Thus designing a facial hair trimmer for a lady was not easy and impressing her with its looks was next to impossible. It seems that the designers from Panasonic kept in mind all these factors while designing the Panasonic ES2113PC Facial Hair Trimmer and did more than a commendable job to blow her minds. The Panasonic ES2113PC Facial Hair Trimmer can easily pass off as a pen or a highly advanced lip liner. This is an ideal addition to her grooming kit and can easily go into her purse or vanity bag. 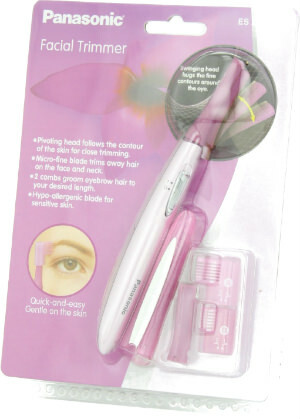 This travel-friendly facial trimmer has a thulian (subtle metallic pink) colored long handle and a magenta trimmer head. This magic wand shaped slender plastic trimmer has a metallic look and a feather like curve to it. It has a comfortable grip. It fits into her hands snugly and has a small elongated silver switch that acts as the power button. The trimmer can be activated by pushing this button to mode 1 and can be switched off by putting it to 0. It has a transparent magenta cap with a silver clip that covers the trimmer head and protects it while she is travelling with it. We have to give it to Panasonic for this unique design. The Panasonic ES2113PC Facial Hair Trimmer has a pivoting trimmer head. It moves to about 10°on each side from left to right along the pivot and can easily flow along the contours of her face. 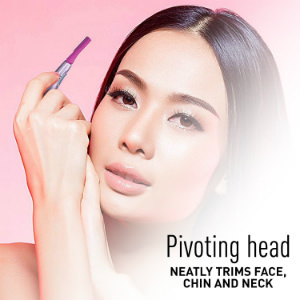 The trimmer is designed for effortless maneuvering and gently moves across her face, chin, jaws and neck. The trimmer head has ultra-thin, hypo-allergenic, stainless steel blades situated at its tip. These blades are extremely sharp with rounded tips so that they are gentle even on the most sensitive of skins. These blades are durable and can last you a longtime. But it’s difficult to find a replacement blade once it wears away. These blades are designed so that she can trim even after she has put up her make-up on. This is needed because sometimes the hairs are only visible after make-up. The trimmer comes with two pink colored plastic comb attachments (A and B) of different lengths. 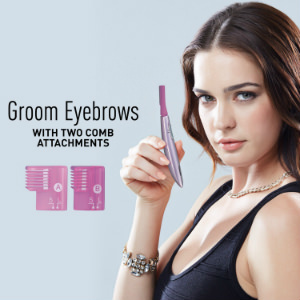 They can be easily snapped on the trimmer head and she can use them to do her eyebrows to the desired length and style. The trimmer blades work equally well with fine and coarse hair. 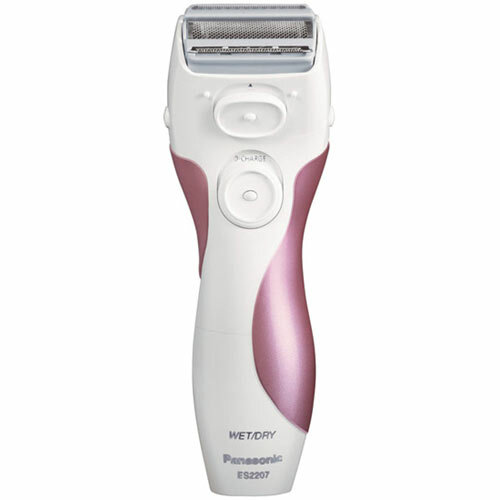 The Panasonic ES2113PC Facial Hair Trimmer can be used dry only. It doesn’t require any gel or soap for optimum use and this is why she can even use it on the go. The Panasonic ES2113PC Facial Hair Trimmer is not rechargeable. It can be easily powered by a AAA battery which is readily available all over the world. The AAA battery is cheap and lasts for about 40 minutes of usage time which is also quite decent. So she doesn’t have to worry about the voltage compatibility and the compatibility of the socket when she is travelling. The Panasonic ES2113PC Facial Hair Trimmer is an ideal travel companion. This is because it is compact light weight and very difficult for anyone to understand that it is a trimmer. It can easily pass off as a fountain pen. It has a trimmer head cap so that it is not damaged while travelling. It can fit into her purse comfortably. It uses a AAA battery that is readily available. The Panasonic ES2113PC Facial Hair Trimmer can be cleaned very easily. You do not have to wash it under water. A simple dusting with a soft brush frees it from the residual hair strands. So it’s love at first sight for her. There is also some good news for the men out there. If she asks you to treat her with one then you can be rest assured that she might not know that it’s pretty cheap and at least for this time it doesn’t pinch your pocket.